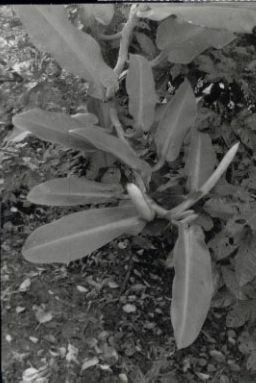 When a plant of P. subg. 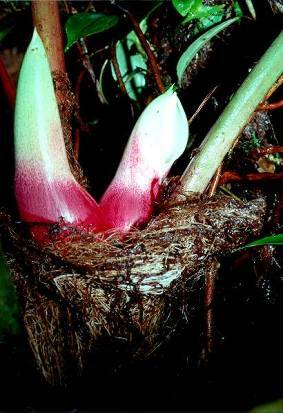 Philodendron flowers, the stem apex is consumed with an inflorescence (or frequently an aborted inflorescence primordium) (Ritterbusch, 1971; Blanc, 1977b; Madison, 1978) and new growth is from a bud in the axis of the penultimate leaf. This new growth pushes aside the newly developing leaf and the inflorescence which is developing in its axil (Ray, 1987a). 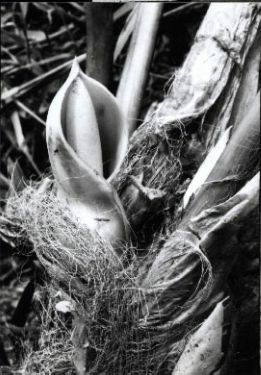 When the inflorescences abort, the petiole sheath remains quite small and unexpanded but when the inflorescences develop, the sheath may be very much larger. 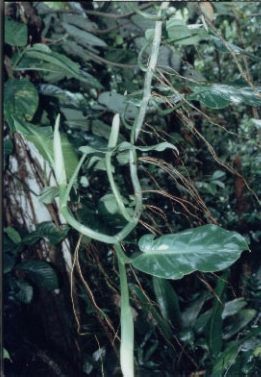 Philodendron inflorescences are sympodial with each sympodium consisting of 1-10 (to 11 elsewhere) inflorescences arising typically in what appears to be the leaf axils of usually one of the upper leaves (but almost never in the uppermost leaf axil). Often inflorescences emerge from the mass of cataphyll fibers, enabling them to remain moist (Figs. 63, 115, 188, 371, 430). 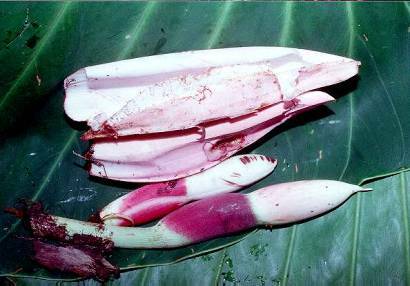 The individual inflorescences are subtended by and enclosed in a series of moderately coriaceous, whitish to pinkish, 2-ribbed structures (Fig. 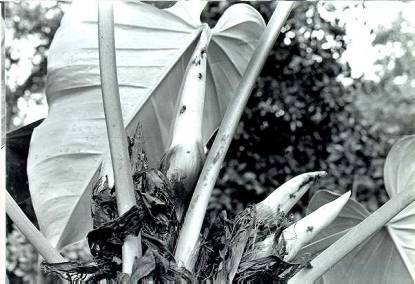 195, P. gigas, Fig. 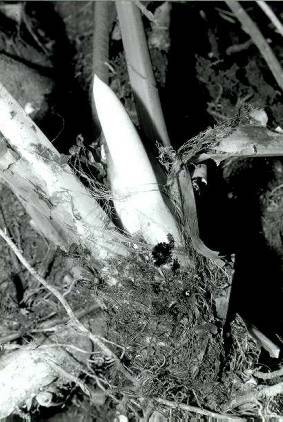 428, P. tysonii) called bracteoles (Ray, 1987a). These have been elsewhere referred to as prophylls (Usher, 1966; Jackson, 1971). At anthesis the bracteoles are typically deciduous though sometimes they persist for a time simply because they are held so tight by the developing infructescences. 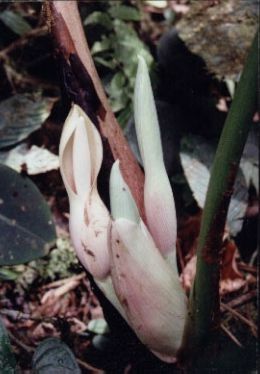 Typically the inflorescences are borne in the erect or semi-erect position regardless of the position of the stem. 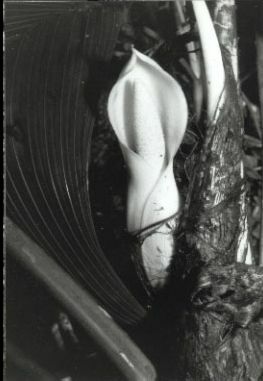 Even when the inflorescence is borne on the end of a pendent stem, the stem usually curves upright, apparently in order to assure that the opening inflorescence can be erect at anthesis (Fig. 273, P. ligulatum var. ovatum; Fig. 269, P. ligulatum var. ligulatum). Most species with a single inflorescence per axil are either vines or appressed-climbing hemiepiphytes with internodes longer than broad. Among those species with elongate internodes and one or sometimes two inflorescences per axil are: P. anisotomum, P. bakeri, P. correae, P. granulare, P. immixtum, P. ligulatum, P. mexicanum, P. microstictum, and P. hederaceum. Variable also is the number of upper axils on a flowering plant which bear inflorescences. Some species, e.g., P. lentii, rarely have more than one leaf axil bearing an inflorescence, while other species, e.g., P. annulatum and P. fragrantissimum, bear inflorescences in two or more of the closely spaced upper internodes, making it appear that the plants have a large number of inflorescences. Species with five or more inflorescences per axil are rare, totally only eleven species with only six species having up to five inflorescences per axil and five with up to six inflorescences per axil. Only a single species, P. gigas has up to seven inflorescences per axil and only one species, P. heleniae has up to ten inflorecences per axil.